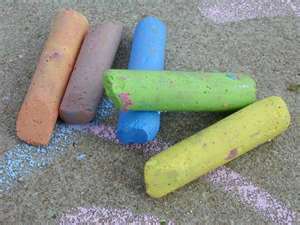 High Heels and Mommy Ordeals: Mommy Mondays- Homemade Chalk! My little one has discovered that coloring on the walls and fireplace is way more fun than doing it on paper! I came across this "recipe" today and thought, "what a wonderful idea!" Cover one end of the toilet paper tube with duct tape. Toll and 8x4.5 inch piece of aluminum foil and insert it into the tube so it lines the inside. Make sure it's a tight fit. Set the tube on a protected surface, duct tape down. Use your disposable plastic container and mix 1 cup plaster of paris with 1/2 cup of water. Slowly stir for about one minute or until dissolved. Immediately after that, add 2 tablespoons of paint and mix until blended. Add more for a brighter color chalk! Spoon the mixture into the tube. Tap gently to allow the mixture to settle. Let it dry overnight. Wake up the next day and waa lah! Send the kids outside and draw you a driveway masterpiece!